Land surveys can be complex documents. 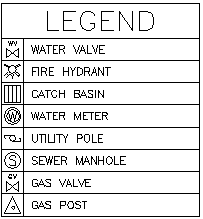 A lay person may be overwhelmed by all the text, lines and symbols presented on a survey plat. This document is intended to help the average person understand how to interpret the information provided on a typical land survey. Symbols on a drawing can represent anything that the drafter chooses. There is no national standardization for property surveys so these symbols may vary from state to state and even by county or community. However, there should be a legend or text near the symbols on the drawing explaining what each symbol represents. The best symbols resemble their real-world counterparts, when possible, such as this symbol of a fire hydrant. The first lines one should notice on a properly drafted survey are boundary lines, since boundary lines usually are bolder than any other lines on the survey. The property boundaries, after all, are the primary data that a land survey communicates. One should be able to clearly identify the boundary lines and their corresponding measurements above all else on the survey. Underground utilities are not shown on the survey unless specifically requested. This is an additional contract item. 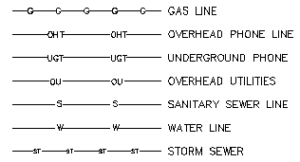 Even then, a disclaimer will be added that the utilities are only shown to the extent marked by utility marking companies or copied from existing utility maps provided by utility companies. Surveyors have no capability to locate structures not visible from the surface. Pay close attention to the survey notes. Here the surveyor relates important information about the survey and his findings. The date of the survey and scale of the drawing should be indicated. Adjoining property owners or subdivision lot numbers should be indicated on all sides. The survey should note whether the property is in a special flood hazard area as established by FEMA. If the property is in a special flood hazard area, a line showing the extent of the hazard area should be shown. In some cases the entire property may be in a flood hazard area. Take a close look at all the boundary lines around the property. If any structures project across the boundary they should be clearly noted. Often, structures near the boundaries, such as fences, indicate what surveyors call “occupation evidence.” Occupation lines occur when adjacent owners make unspoken claims of land ownership. Sometimes occupation lines coincide with actual property boundaries, in some instances they conflict. Occupation evidence includes fences, buildings, hedges and other plantings, vehicle parking, driveways, etc. This kind of use may lead to an adverse possession claim if it continues for the statutory period. If encroachments are discovered by your surveyor it is important to address them. Survey calls are a mystery to many people. This section will be a short tutorial on what they mean. First one must be familiar with the four cardinal directions as indicated by the compass rose – North, South, East and West. 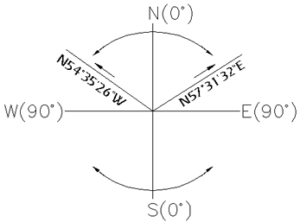 The cardinal directions divide the earth into four quadrants (refer to the figure below.) Each quadrant represents a 90 degree segment of a full 360 degree circle. Zero degrees begins at either the North or South direction, measured to 90 degrees at the East-West directions as shown. A survey bearing indicates the quadrant in which it exists and the number of degrees into that quadrant measured from zero. The distances are usually indicated in U.S. Survey feet. Sometimes a client will note that measured bearings and distances vary somewhat from the recorded measurements shown within the deed or on the plat. Do not be alarmed. This is perfectly normal and expected. A measured bearing or distance will virtually always vary from the record. There are many reasons for this. It is helpful to have some knowledge of the theory of measurements, residuals, and normal distribution curves but that is beyond the scope of this paper. Suffice it to say that there is no such thing as a perfect measurement. As an exercise, one could go outside and place two nails in the ground at a random distance apart, greater than 50 feet. Ask three different people to help you measure the distance between the nails to the nearest sixteenth of an inch with a tape measure. No matter how carefully you measure, each time you will get a slightly different measurement. Averaging the measurements will give the most accurate result. This is a brief, simplistic explanation for the differences in measurements by survey and those on record. There are many other factors involved. The skill of the original surveyor, the type of equipment originally used, the length of time elapsed and changes in technology since the original survey was performed must all be considered. Differences in measurements are a fact of life in the real world. Rest assured that we have taken the greatest care to adhere to the proper standards of measuring for your land survey. Since space is so limited, abbreviations are common on survey plats. Sometimes the professional uses nomenclature that is so familiar in the industry that he forgets that a client may not know what a particular abbreviation means. Oftentimes the abbreviation is intuitive, such as “conc.” for “concrete” or “asp” for “asphalt.” Some common abbreviations are listed. If you see something on your survey that you do not understand, please ask. We are here to answer your questions. The property corners on your survey will be marked. If a property line is very long it may be difficult or impossible to determine where the boundary line is, on the ground, along the entire line. In such cases it is helpful to have the surveyor set stakes along the boundaries at intermediate, inter-visible points. This is an additional contract item that is not usually done unless you have made prior arrangements with the surveyor. The survey should be certified as to accuracy, that it meets the standards of the state in which it was performed, and signed and sealed by the professional surveyor. Your business means a lot to us. You could have selected any land surveying company, but you chose us. We appreciate it. We strive to provide products (maps, reports) and services of the highest quality. We want you to be completely satisfied. Please let us know if there is anything we should do to serve you better. In addition, please consider recommending us to your friends and associates.